The largest upright available in the Essex range offers greater versatility of sound than its counterparts, while offering a commanding presence and stately appearance. A nicely balanced upright with elegantly proportioned, classically styled straight legs, the EUP-123E has a timeless design which makes it a great choice for even the most eclectic of homes. A perfect entry-level piano for beginners, the Essex piano is designed by Steinway, manufactured globally, and incorporates Steinway & Sons’ latest design specifications and engineering standards, as well as the Steinway commitment to excellence developed over 160 years of quality craftsmanship. Every Essex instrument is inspected by a team of highly experienced Steinway & Sons trained technicians before it leaves the factory. The Essex incorporates the latest design and engineering enhancements from Steinway’s dedicated research and development team. By utilising specially engineered materials, large-scale production techniques, and carefully selected manufacturing environments, the Essex is able to deliver a level of musical performance previously unattainable in its price range. 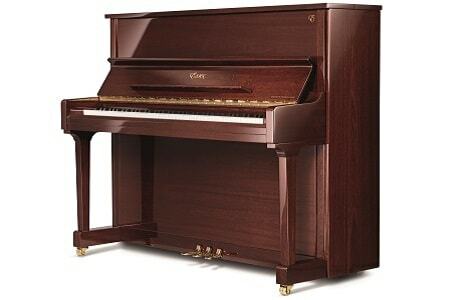 Each Essex piano is backed by Steinway & Sons and serviced by Steinway-trained technicians. The Steinway Promise: If you decide to trade-in your Essex piano for a new Steinway grand piano at any time within ten years, you will receive a trade-in credit equal to your original purchase price.